I didn’t realize it until I had retired, but I think when you deal with people who are sick and dying all the time, your outlook on life is different than people who aren’t subjected to that. You don’t tend to be a glass-is-half-full person; you see some of the poignancy of life and some of the sad, tragic things that occur and that maybe part of where I’m coming from. You can purchase copies of Diamond’s photographs here. Isn’t this just so sweet?! One of my friends is helping a friend with her wedding plans and the subject of wedding gifts came up. Specifically those wedding gifts the bride and groom give to those in the bridal party, the groomsmen, the parents, etc. As lovers of vintage and antiques, we naturally gravitated to the idea of an excuse to scour antique malls and online stores for just the right gifts. But not everyone loves old things. Since weddings are special occasions, when families grow and joint memories begin, you want to give pieces which will be saved — you want to give things which will become heirlooms. When selecting gifts to mark the occasion of a wedding, consider who the item is for, their role in the special day, and what sentiments are likely to be attached to that day. Drinking glasses and flasks are popular for men because items associated with drinking are reminders of the wedding toasts made. Jewelry and jewelry boxes are popular for female attendants because they are reminders of special days in the past as well as more to come. 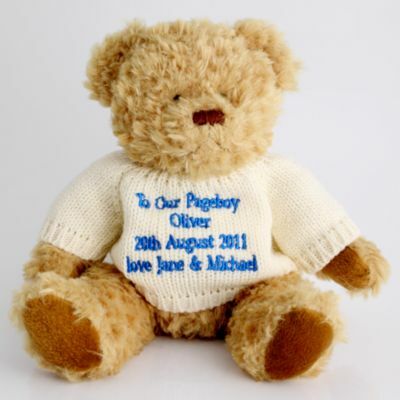 Personalized teddy bears are great options for children because they are playmates for that day, and toys that sit proudly on display to remind kids of the special day they took part in. There really aren’t any wrong gifts to give, but thinking about the future use of items helps ensure that they will be saved — and on their way to becoming heirlooms!